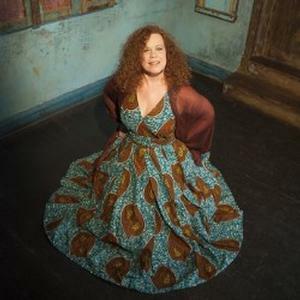 Soul, R n’ B and jazz singer, Sarah Jane Morris is a veteran of the music scene and she’s here in Edinburgh to play selections from her latest album, Bloody Rain. The album itself is a collaborative piece, comprising live recordings with a host of musicians including Seckou Keita, Courtney Pine and the Soweto Gospel Choir. Today, Sarah Jane is is performing ‘unplugged’ with acoustic guitarists Tony Remy and Tim Cansfield and they make a skilful trio, all musically talented, so the sound is superb. It has to be said we like them best when they’re performing covers: a slow soulful version of Nick Cave’s Into My Arms is a thing of beauty and Sarah Jane’s voice is at its best on soul standard Little Piece of My Heart. Some of the original material though, doesn’t quite hit the mark. Songs about honour killings and the Boko Haram kidnappings are clearly well-intentioned but the lyrics are a bit too sixth form and simplistic to really have much effect. A few of the Soweto-style numbers were absolutely crying out for a drummer, but overall the undoubted musical ability of the trio meant that most of the songs had the necessary heft. To get the full effect though, you’ll certainly need to check out the album.